I have been almost paralyzed since the election. For a week I kept thinking it was all a bad dream. I have spent enormous amounts of time reading what everyone has posted, what responsible newspapers like the New York Times and The Guardian were saying. Some I found too depressing. Some I found too divisive. While the finger pointing “who is to blame” seems to dominate, the painful new reality of what life under a Trump Administration is likely to bring especially to those among us who are most at risk is staggering. I was actually hopeful for a minute that, perhaps naively so, that if approached right, he was persuadable. But now that I’m seeing his cabinet picks I have lost hope. This soon-to-be-Oil/corporate Administration, is also anti labor, anti civil rights, and if confirmed will be the least diverse cabinet of the last three Administrations. I have been in Atlanta, Los Angeles, New York and North Dakota and I have listened a lot. I’m still listening, and reading, because in a country as large and diverse as ours, I understand that there are a variety of reasons why the democrats lost: Russian hacking, we needed more on-the-ground canvassing, better protections of voting rights, more aggressive rejection of false equivalencies, and fake news, the list goes on. But it is perhaps worth remembering that Hillary Clinton is approaching a 3 million popular vote margin, and Trumps electoral college win, ranks 46th out of 58 contests. Perhaps there is much Democrats can learn from and build on there. We shouldn’t lump all Trump voters together or demonize them. We need to go to the grassroots and listen, learn and educate on the issues. One organization that’s doing that is WORKING AMERICA. We know that Trump can’t fulfill his promises. So we know there’ll be millions who’ll be sorely disappointed in time and begin to feel buyer’s remorse. We have to be there for them with alternative solutions such a the job-intensive clean energy sectors. We can’t allow the 1% to try and divide us for their own gains—or keep many people poor and disenfranchised, also for their own gain. While I’ve been mulling over next steps for an activist like me, I’ve also stayed on top of what’s happened at Standing Rock. You all know President Obama canceled the pipeline’s easement. Bravo for him and for the courageous Water Protectors. But we all knew this wasn’t over. DAPL is refusing to move or be rerouted and a freezing blizzard sent many water protectors and their veteran supporters home. I’ve been told that everyone is poised and ready to return if that is needed. But, in the meantime, there are serious financial issues confronting Energy Partners Transfer, the company that has developed the pipeline this far (they’ve recently been bought by Sonoco). The company negotiated its contracts with banks and shipping companies, etc in 2014 when the situation in the Bakken oil fields was very different. The price of oil has dropped and there is a glut of pipelines up there. Unless there is a drastic improvement in the oil production there and a rise of the price of oil in general (highly unlikely) DAPL is totally superfluous. Existing pipelines and refineries could handle the region’s output. DAPL is trying to rush to completion largely to protect their favorable contract terms from 2014. But DAPL’s contracts stipulate that if certain terms and conditions aren’t met, their financiers have the opportunity to renegotiate their relationship to the pipeline or withdraw altogether. We don’t know what exactly the terms and conditions are but we think that one of them is that the pipeline be completed by January 1st. That won’t happen. It is also possible according to some sources that DAPL told the banks they had all the needed permits and easement which they didn’t. Then too, there’s the grotesque fact that this company has been rated as the WORST company among all the pipeline companies both in environmental and safety terms. According to the National Lawyers Guild, Energy Transfer Partners is being sued by 5 states for contaminating groundwater. Why isn’t the press covering this? 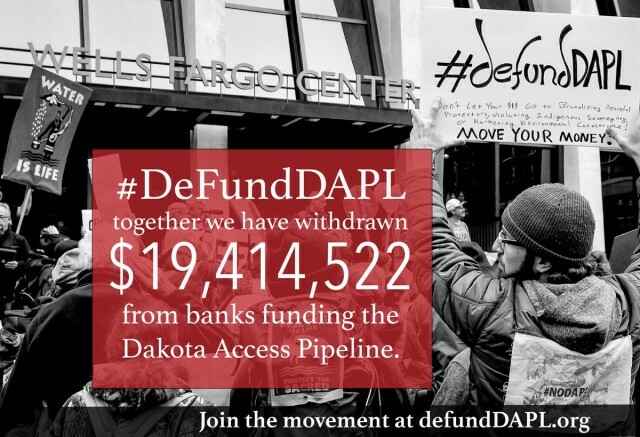 And for those of us who have accounts in the banks that have loaned money to DAPL, we should ask the banks how they could have put our money into such a terrible investment. In order to speed up the demise of the superfluous, contaminating, greedy DAPL, a powerful new movement has arisen called DeFund DAPL. We are taking our money out of those banks. Please go to this link so see the names of the compromised banks and how to take your funds out as I am doing. Thank you for standing up at Standing Rock and cheers here for the demise of DAPL. BTW-Donald Trump holds stock in the Texas-based Energy Transfer Partners and also Phillips 66. According to MSN, as of May, disclosure forms stated that the President-elect held $15,000 to $50,000 worth of stock in ETP and $100,000 and $250,000 of stock in Phillips 66. Phillips 66 has one quarter share invested in the Dakota Access Pipeline. Welcome back, Ms Fonda! You were missed. God bless. Hi Jane! I was rendered almost completely numb after the election. In the weeks that have followed as we hear, day by day, his latest picks for positions in his cabinet…it feels more and more surreal. What a nightmare! And it just gets weirder and weirder every day. Now with the Russian hacking news I feel the need to beat my head against a wall to try to wake myself up from this nightmare. I look to next weeks electoral collage vote with great anticipation. I’m not getting my hopes up, but am truly interested to see if they do their jobs in the way it was intended from the beginning. Thank you for writing the TIME magazine article about the pipeline. It was very informative. I was not surprised in the least when I read it and learned that you spent Thanksgiving with those that were there. The type of thing that sets a great example for the rest of us. I hope you are well otherwise and are able to enjoy this holiday season. Merry Christmas and Happy New Year! I, too, was beyond words, beyond belief, beyond consolation on November 9th and for many days after. The entire election has made me question who we are as a nation. I genuinely never thought we would elect a game show host for president. His haughty promise to “drain the swamp” only brought in an entirely new breed of reptiles. I write to you to thank you for all that you have done over the years and for what you continue to do. You have the courage to say what so many of us are thinking. I also appreciate the facts you present and how we can make a difference. It all matters. I’m so glad you’re back. It’s been an unbelievably difficult time for humanity and glad that we have a voice like yours, a person who understands this crazy world more than us and I’m very happy that you’re doing the most you can. Your words cannot be more true and I agree: people are disappointed and confused and yet they will be the ones suffering the most. I also agree on the fact that we shouldn’t demonize anyone, we should try to understand. I didn’t really approve of the rhetoric of some of the people on Trump voters. I’m glad to see someone with empathy and a willingness to understand how this could have happened. After a month-long recent struggle with a major depressive episode, I really reevaluated my life. I read your books' parts on your own struggles and it gave me a great deal especially then so thank you! So I have you to thank for a lot… again. I hope you're doing well! 🙂 Hugs! We definitely need to listen — really listen — to each other. I’m still in shock at how this election played out. I’ve continued to meditate on it, and I know it will take a while for me to get my balance back. I know I will: I just don’t know when. Wisdom will come. Trump got what “he thought he wanted/needed”. However, it’s like watching an eleven-year-old with the keys to his parents’ car maneuvering down the road on a crowded morning during rush hour: it’s truly cringe-worthy. It’s great that you’re back. I’ve missed you and your input on so many things. You are so knowledgeable on so many things. I have a question for you that you probably can’t answer but when I was visiting LA while the elections were on and on the morning after the results and the political earthquake I noticed that no one, either at our hotel, or in restaurants or the mall talked were talking about it. I thought such a seismic event and I’m not hearing one public comment. Believe me, after Brexit over here people were almost ending their friendships publicly. Was so interesting to observe. So glad you speak out on so many issues. You’re inspirational. Thank you…. you have been inspiring me for years. I wish your voice could be heard by so many more people! Glad you’re back. I am making my way back too. You’ve made good points here. For my part, I feel it’s time to step up and become a full-fledged citizen, one who will not complain without also taking action. Thank you for ideas on how to take a stand against against what DAPL is doing. I am particularly outraged about their employing state police forces, top global security companies (including canine security companies) against American citizens. If we do not speak out now, we are basically condoning corporate militarization. BELIEVE THAT TRUMP WILL NOT ONLY DO WHAT HE SAY’S BUT EVEN MORE! VERY WRONG,, BECAUSE WE ARE IN BIG TROUBLE! Sigh. What a mess. Trump and his cabinet will cause an incredible amount of damage in the next four years. It will takes years of work to fix it. His cabinet choices are unbelievable. If I am reading things correctly, he chose an oil executive with deep ties to Russia, a former Goldman Sachs executive who invested in a bank that foreclosed on thousands of homeowners, a board member of Energy Transfer Partners which is attempting to build the Dakata Access Pipeline, a man who was accused of making racially charged remarks as a U.S. attorney, a fast-food CEO who is against increases in minimum wages, an education activist billionaire who championed vouchers and charter schools . . . We are in trouble. I think . . . . I hope, Trump supporters will be shocked by what takes place these next few years. I think many voted for Trump simply because they did not want Hillary. Yes, buyers remorse will eventually take place. Of course, some how for the next couple of years things will be blamed on Obama. That is how it usually works. It is time for all of us who did not vote for Trump to not just speak up about the issues, but shout it out as loudly as possible to the world. We can no longer sit back and let others be the activists. Everyone needs to step up and let their voice be heard. Everyone needs to educate themselves on the issues. When browsing the internet or social media outlets, everyone needs to fact check the information they read. Jane, lead the way and others will follow. Pass along information like you just did on this blog. I now know what bank I need to pull my money out of and will share the link with others. Thank you. On a lighter note, congratulations on your Screen Actor Guild Award nomination! I was extremely excited to see your name on the list. Well deserved. You just hit upon the biggest problem that I am having with this election. I’m having such a difficult time NOT looking at Trump voters (including friends and family) with a jaundiced eye. Because in my mind if you voted for him, you co-signed his book of hate . . . regardless of how you “really” feel you condoned his hateful rhetoric. I cannot understand for the life of me how decent people voted for him. For me, this went way beyond politics. I wouldn’t vote for someone like Trump regardless of party affiliation. I think the POTUS needs to exhibit a basic sense of human decency, and he does not. It’s going to take a really, really long time for me to square this in my head. I am moving forward and will stay involved and do all I can to stop this man from destroying this country, both for me and my patients’ sake, but this lingering sense of total disbelief that so, so many people were sucked in by this sociopath just makes my heart ache. Rebecca, I really understand. But it’s complicated and we have to try to figure it out. As I get clearer I will post about what I’ve learned. but in the meantime, I am positive that we must listen carefully and not demonize. That’s what Trump has been doing and we have to do the opposite. And try to help the folks who did vote for Trump to, in time, see how he doesn’t really care about the very people who voted for him and won’t be helping them. As the fallout of his corporate/fossil fuel Administration comes clear we need to be ready to help people see the alternatives. Yes. I am trying to stay positive and move forward. I have huge concerns re: women’s reproductive rights. We are already seeing a surge in prior authorizations being requested by insurance companies even after the simplest of old school, generic oral contraceptive pills are prescribed. Women fear they will not be able to obtain their medication—lest we forget that not everyone prescribed an oral contraceptive uses it for birth control—we use them for a myriad of medical issues. So unbelievably frustrating to have patients in tears as they fear they may lose their insurance. We shall see . . . .
WE CANNOT STOP FIGHTING!!!! DEMAND OF YOUR ELECTED OFFICIALS THAT THEY NOT CAVE TO TRUMP’S AGENDA. IF ENOUGH PEOPLE RAISE A RUCKUS MAYBE WE CAN HOLD ON TO OUR RIGHTS. I am worried about the next four years. I happen to believe that he is incompetent. I think he’s a lot of other things that I cannot write on anyone’s blog! I am a teacher. I want the the best for all children … for everyone really. It’s difficult to see the middle class being destroyed but how could anyone believe that billionaire Trump wants to help anyone but himself. I’m disgusted, disheartened …I’d like to retire and do other things, teach part time, volunteer, spend time with my grandchildren …but now I’m afraid! In such a huge fan of your activism and you work. I love hearing the voices of strong and impressive/influential women. I’m going to the march in Washington and I want to do more! I just love this reply by JK Rowling yesterday regarding her outspoken views on Trump to someone who said that as she lives in the UK she “should worry about her own problems champ”. JK Rowling: Trump’s the whole world’s problem, Sonny Jim. Thank you for being an inspiration in my life since 1982. Jane, your dedication to having a respect for one’s body, mind and our Earth has and continues to be a paramount significance. I am grateful that you are part of our World! As you are likely very well aware, wealth bestows an honor to individuals and grants access to power that even in democracies is easily corrupted. I commend your willingness to call out those who abuse it. Living with decades of personal character attacks takes a thick skin, even with privilege. I feel we have become lost in the illusion of our own hype. No one nation or people are ‘more’ special. We are as good as we treat our least. Don’t people understand that to be led by a liar is to ask to be told lies? Many happy returns 🙂 I pray that you be among us for many many years. You are precious and beautiful. Huge hug. Love and peace! Have fun today! Thank you for blogging again, Jane. The only alternative I feel, to giving up on Trump doing anything worthwhile, is to do as The Course In Miracles counsels, that in these situations which seem hopeless, all we need to do is simply to pray for Trump to find the peace of God, which we all can access, as it is there always for us. Further, I add, a prayer that Trump remembers that he is a Child of God, which we all are, and as such, to be accepting of others, open to others’ needs, and aware of others. Doing so gets us out of judgment and helps us to remember that we all have the same needs; are all equal under God, and, as brothers and sisters, we are, truly, one spirit. Thank you for this Jane– you have been missed! We need you and your interaction. That said we enjoyed your update! As staunch Santa Fe Democrats, the election results were numbing– like a kick in the gut. Our city fought hard for Hillary and just assumed that she would be the next President. However, we underestimated the sentiments around the nation toward a more liberal, all-embracing, America. This hurts both my partner and I deeply. We are a gay couple who moved to Santa Fe to be married in an all-embracing city, the city different, one of the most Democratic (blue) strongholds in the west. After coming here we yearned that the entire nation would want to reach for the principles and goals of magnanimous men like our openly gay Mayor who has fought tirelessly to unite ‘all’ people, not just Santa Feans. But this embracing of humanity is being shadowed by darkness sweeping across our nation. Sadly, because of the great strides LGBT have gained under Obama, we are the now the new targets of the extreme right. I refuse to blame the Democratic Party for our loss– there is too much finger pointing. My partner and I are still proud supporters of the only party that truly stands for all people. We need to stay united, get past licking our wounds, and stand together to unite this great country! The new administration will not succeed, we will not return to the darkness of Nazi Germany, somehow we will walk out into the light at the other end. Thank you for your wisdom and inspiration during these dark times. Light, love and happiness to you and your family! Looking for some trailers I found videos about paparazzi literally running after you in a public car Garage…..while you were hiding between cars….. I new that paparazzi way must be agressive, we all have red stories about them…but seeing this with my eyes Gave me mixed feelings and honestly not positive at all. I was sorry to see so small respect for the person they want to take a picture from. So I asked myself if we , as fan and readers about all what concerns you, were somehow responsible for this and how people like you can continue to be exposed to this aggressive part of the media on and on……. What can we do when faced with such malicious and powerful forces? I’m not totally mature, I’m not passed my demonizing and finger pointing processing phase. This man can not have been more clear in telling people who he is and what he stands for, and yet people line up and put their mark by his name. As I move forward through time to tomorrow I just keep telling myself this one basic truth … we do NOT know the future. model for all women, no matter the edge!!! Thanks, Dona. Here’s the problem: unless a script comes through an agent, we cannot accept it. It’s a legal issue. I ignored the issue once and got sued and I never will again. I hope you understand. Maybe you should try to get an agent.